Laterna is one of those odd blink and you miss it places. 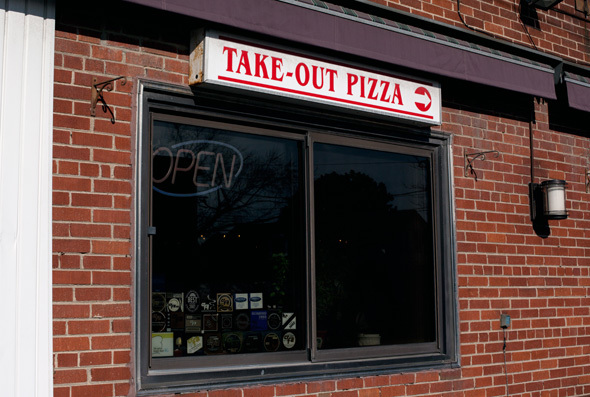 Located in north end of the city, just south of Steeles on the east side of Yonge, Laterna is a chameleon of food with offerings from pasta to steak, souvlaki to pizza, it accommodates even the pickiest diners, which is probably why it's always busy, especially with families. 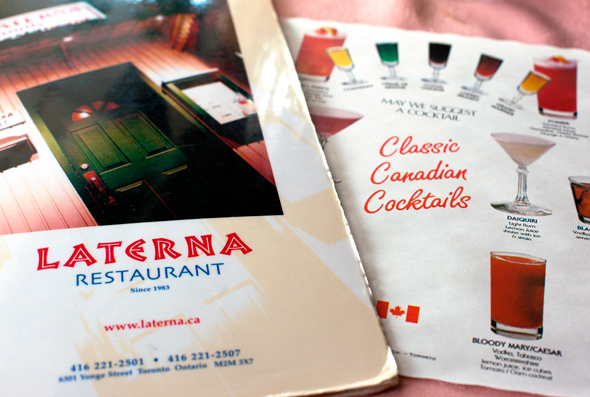 Laterna is a relic in the ever changing Willowdale area. It has been owned and operated by the same family for 28 years. A true mom and pop shop, their son Aris Gianopoulous now does most of the day to day duties, while his parents prepare the food, all of which is made in house. Since my dining compatriots were ravenous, we started off with the small greek salad ($8.75) and an order of fries ($3.25). 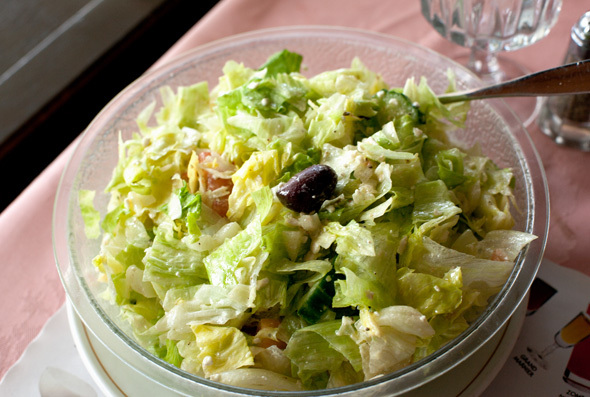 The salad comes appropriately family-style, with giant tongs to help you assemble your plate of iceberg and romaine lettuces, olives, tomatoes, cucumber, feta cheese and tiny diced celery. The dressing is very subtle, no creaminess detected here. The fries were crispy and piping hot, a good sized portion with plenty to share for the table. Next up were the mains, which were also hard to contain on their dinner sized plates. What is this, a restaurant for giants? Not that I'm complaining...the chicken super souvlaki ($9.50) and the gyros super souvlaki (also $9.50) were belt busting delicious! The pitas, like everything else they serve are made in house, and are just the perfect blend of crispy and slightly chewy. A slight caution, to eat properly (wait staff will correct you if you attempt to tear open this marvel) leave the souvlaki in its foil and unwrap it as you go. 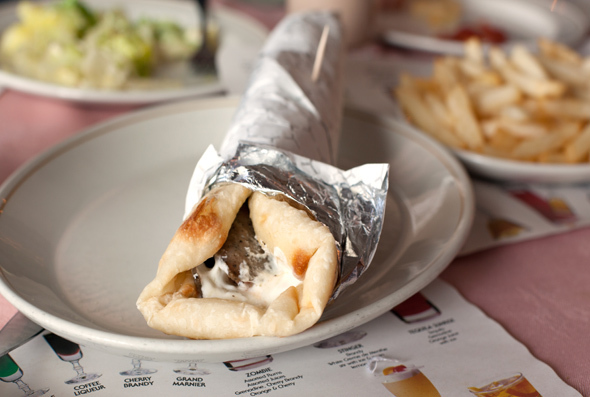 The garlicky tzatziki sauce is best left to soak in the wrapper, and not on your pants. The chicken is grilled and not at all dry, the gyros slightly greasy, but certainly satisfying. Both come stuffed with onions and tomatoes as well. 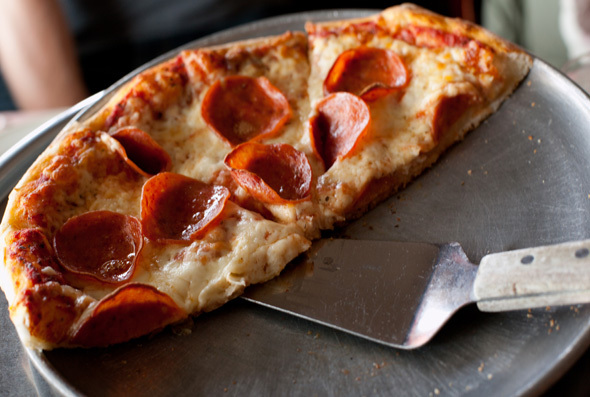 We also ordered the small pepperoni pizza ($11.75, plus $1 each per topping, whole wheat option also available). Served majestically on a towering platter, this pie is pizza precision! The cheese is gooey, the crust not too thick and the pepperoni mild. With no room left for dessert, we lingered a bit while the hurried wait staff got our cheque in order. Most of the servers have worked here for more than 10 years (ours was celebrating her 23rd anniversary that month). 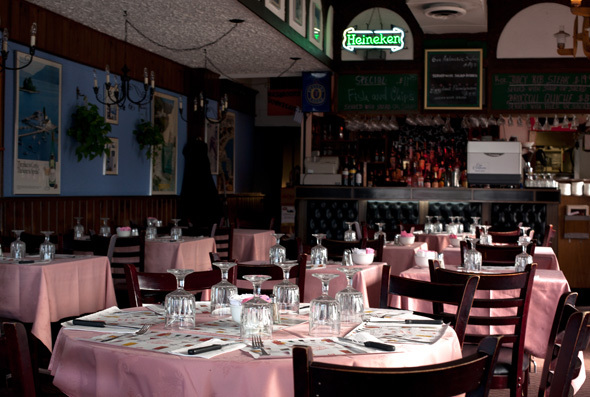 The food is definitely worth the drive, and the service will make you feel right at home. It's my unofficial Danforth North .